The American-Scottish Foundation® is a founding member of The Scottish Coalition, USA. On December 19, 1991, in response to action initiated by the Clans & Scottish Societies of Canada, the Ontario Legislature passed a resolution proclaiming April 6 as Tartan Day, following the example of other Canadian provinces. America followed suit on March 20, 1998, when Senate Resolution 155 (S. Res.155), proposed by US Senate Republican majority leader, Trent Lott, was passed unanimously. The Living Legacy of Scotland, Inc. The Coalition has been instrumental in setting up a national platform for the Observance of Tartan Day in the US, through the development of a network of State representatives. Over 33 states are represented at this time with the American-Scottish Foundation representing New York State as of January 2012. In 1998 Alan L. Bain spearheaded the New York City Tartan Day Parade up a side walk in Manhattan, to be followed by the first permitted parade in 1999 in Central Park. In 1998 The Scottish Coalition saw the Senate Resolution adopted recognizing Tartan Day, leading to Congressional and then Presidential passing of the recognition of Tartan Day Observance on April 6 each year. In 2002 The American-Scottish Foundation partnered in the formation of the National Tartan Day New York Committee with the St Andrew's Society of the State of New York and the New York Caledonian Club to oversee the Parade's growth and give oversight to the associated events of the week in New York. 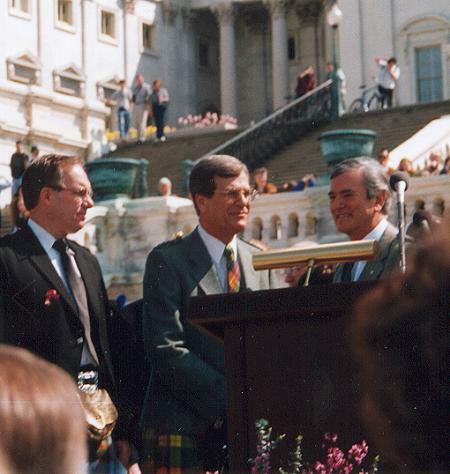 In the formative years of 2000-2003, the American-Scottish Foundation also arranged Tartan Day programming in Washington D.C.
Americans of Scottish descent have played a vibrant and influential role in the development of this country. However not until 1997 was this influence recognized by a single-year U.S. Senate Resolution that appeared in the Congressional Record of April 7, 1997. In 1998, National Tartan Day of April 6 was officially recognized on a permanent basis when the U.S. Senate passed Senate Resolution 155 recognizing April 6th as National Tartan Day. This was followed by companion bill House Resolution 41 which was passed by the U.S. House of Representatives on March 9, 2005. The passage of this bill was due to the work of the National Capital Tartan Committee, Inc. and president James Morrison. The date of April 6 commemorates the signing of the Declaration of Arbroath in 1320, which asserted Scotland's sovereignty over English territorial claims, and which was an influence on the American Declaration of Independence. Canada has been celebrating "National Tartan Day" since 1993. The idea and motivation for creating a similar American holiday was provided by the Scottish Coalition, a group of national Scottish-American cultural organizations.